Well I think that is a strong statement of how much the Historic Dockyard means to this community. When you first enter the building the first thing you notice is the smiley, happy staff at the help desk. If you look even further over to the left you will see their iconic rock climbing wall and the entrance to Laser Quest. If you walk straight ahead then you will reach the helicopter flight simulator and another rock climbing course with a difference. It moves. This means you can go on indefinitely until you fall off, which is incredibly likely as it also tilts back and forth so you can almost be climbing along the ceiling! Highly recommended by our team of journalists who are here today. Also on the ground floor is a simulator that makes you feel like you are in the movie displayed in the cinema room on the first floor. Accompanying it on the top floor are a section of interactive systems that teach their users about the tide and sonar. There is also a laser maze that teaches about light beams and mirrors. There is also a lovely café which serves a wide array of foods and drinks. There are some scientific demonstrations that explain how vehicles move through water. Dotted around the building are some small games that are designed to keep younger visitors entertained. All in all this is a wonderful place to visit for people of all ages and we hope to see you here soon. over the day we have been collecting information about the ship and history in the historic dockyards. We found out the HMS Warrior has a sister called HMS Black Prince. We also found out that Warrior conducted a publicity tour of Great Britain in 1863 and spent her active carer with the channel squadron. On top of that, she built in 1859 and finished in 1861. She was built for the Royal Navy to help win the Napoleonic war. Another ship we collected information for was HMS Victory. She was a 104 gun fist-rate ship for a front line space with the Royal Navy. It was the year of 1922 when she was moved to a dry dock at Portsmouth/England. The dock is better known as the Historic Dockyard she is being preserved as a museum ship. She is also the oldest ship still in commission. We also interviewed the chief executive officer of the Historic Dockyard, Lincoln Clark. Priory Geography is an Expert Centre for the Global Learning Programme which means we try to take part in learning about global issues like sustainability, poverty, world development, the environment, climate change, etc and share this with others. Today during BBC School Report some of Priory’s students have been doing a Sustainability Scrapheap Challenge against Milton Cross school. HMS Illustrious is being decommissioned and the navy are deciding what to do with it. Should it be turned into a floating hospital? Into a tourist venue? Or should the materials be recycled into something to make energy? What is the most sustainable decision? 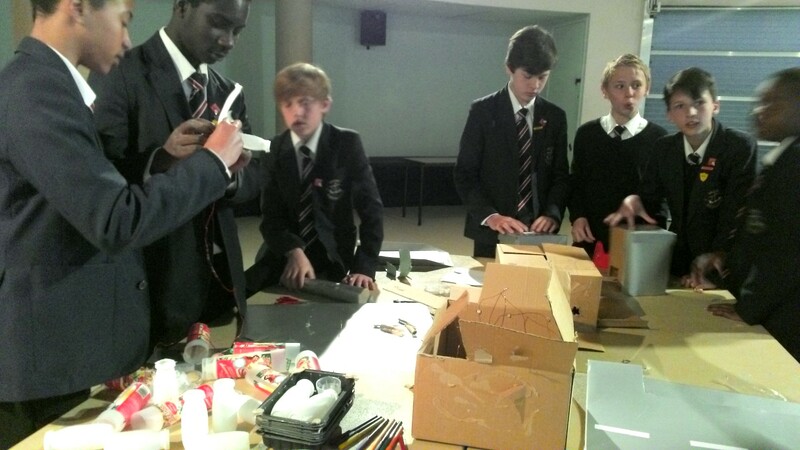 Action Stations took a load of materials and scrap from the dockyard and created three scale model aircraft carriers. 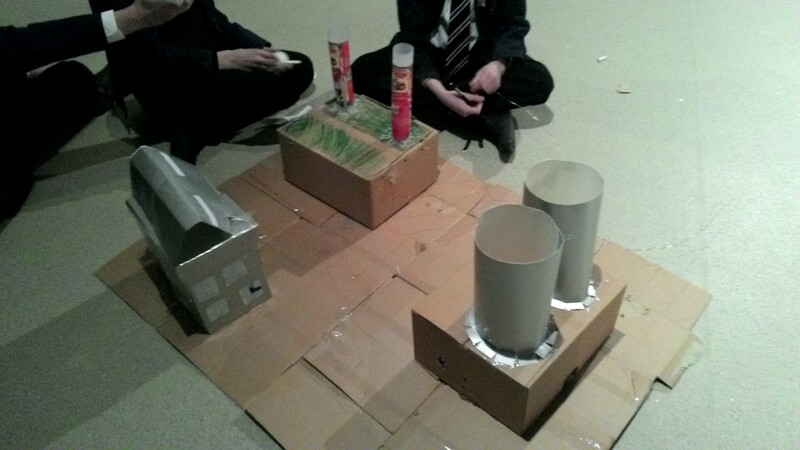 The teams have to take all of the materials and use them to create a working model wind turbine farm. The wind turbine has to look the part but also has to create a circuit that works – a lightbulb has to be lit. It is Team Priory vs Team Milton Cross. Being interviewed on BBC Radio Solent! Two of our BBC School Reporters were lucky enough to be invited to the BBC South Today news studio at Gunwharf this morning. “I felt nervous and confused thinking about what to say! It was exciting and a totally different experience to what I would normally do. My first time in a radio interview!” said Amber. “I felt nervous at first but then gradually overcame this. It was nice being in a real studio and getting a feel for what being a presenter really feels like. It has helped me to rethink what I might do in future and I am interested in journalism.” said Alex. The report can be heard on the Radio Solent website later today. It was very hot, noisy, tense and also fun. But I know it wouldn’t be in real combat. Every corner I turned had my heart racing. But I was also ready at all times. Exploring poetry through laser quest? Can a simulation of laser quest inspire poetry? Can it help you empathise with being in a difficult situation or war zone? Our school reporters tried it out. Hot and sweaty ’twas the environment. I clasped my gun to my chest, hoping not to be shot. The atmosphere was buzzing. Red and blue lights hiding from danger. Darkness: the game has began. Ramps and hidden debris, fellow opponents hiding. My head was racing and heart pumping as I ran through the misty atmosphere. But yet I stood there with glee as I zapped at the red team. Laser quest was really fun but it was quite hard. It was also hard because it was really dark and noisy but overall it was really good and fun to play against your friends. You also let your competitive side out and you take it seriously. I also got annoyed because I would hit the opponents anywhere but where we were supposed to hit them in specific places which was difficult. If I were in a real battle field I would be quite scared but I’d rather stick with laser quest and competition. It’s that time of year again! A team of would-be journalists have invaded Action Stations at the Historic Dockyard in Portsmouth in order to spend the day learning how to make the news. BBC School Report is run each year and over 1000 schools take part with thousands of children aged 12-15 taking part. The students representing @priorygeography this year are mostly from Year 8 with a few experienced Year 9 students who took part last year who are acting as mentors and guiding the day. Topics of the day include the decommissioning of HMS Illustrious and its future, how to be sustainable, the tourist attractions of the dockyard, interviewing the public about the future of the dockyard itself and any other news that breaks. Stories will be posted on here as they are written, but tune back in at 2pm to see the final filmed report! Priory students have been developing ideas on changing HMS Illustrious now it is being decommissioned. Should it be a tourist attraction? Should it be sent to Hull? Or should it be sustainably recycled into a new wind turbine farm? Your thoughts? We have been working all weekend to meet the John Muir Award Level 1. As well as to have fun of course. John Muir was an explorer and loved the outdoors, he wanted to protect it and share it with other people so they could enjoy as well. Discover: we have discovered the woodlands and hills around Juniper Hall on the Box Hill estate. We discovered new habitats we hadn’t seen before compared to Portsmouth. We discovered small mammals of field mice and voles. We discovered minibeasts in the woods. We discovered water bugs in the pond dipping. We discovered what the sky looked like at night with all the stars, and what an owl sounds like in real life. We discovered that there is a special snail that lives here that is the biggest one. Explore: we have explored lots. We explored all over the grounds doing orienteering. We explored the Ha Ha and woods to see what creatures and plants live there and why. We explored the woods to see what they are made of and how they are different to parks at home or to the rainforest we have studied. We explored Happy Valley and why it is a valley. We explored the woods to make shelters and national parks. We explored the big muddy puddles! We explored the grounds and found different plants – and some very weird looking vegetables we had never seen. Conserve: we conserved by working on the dead hedge project. We cut down bits of dead fallen tree and shrubs and recycled these into a dead hedge like weaving. This makes the area neat and gives a habitat for small mammals and minibeasts. Also it helps store carbon which means less greenhouse gases and global warming trouble. We also conserved when we made shelters in the woods because we only used fallen material and put it all back to how it was before we started. We heard we should ‘take nothing but photos, leave nothing but footprints’. We also conserved our environment inside and out because we kept the gardens and house clean and tidy. Share: we have shared our work with the world through twitter and the blog. We have also told our families. And back at school we will share with our friends and will be doing an assembly to other year 8 and year 7 all about what we did and learnt. We also had some fun meeting the award by doing funny missions from the Mission:Explore book. Things like ‘Nature’s symphony’ where we made music to match our natural surroundings and only used natural items. We did some percussion on the tree trunks and using sticks and branches to make a rhythm in the woods. We also did the ‘Act like a Victorian’ mission – although we didn’t have a blanket. But we did find some pond life creatures and then we imagined what we would name them if we were the first people to discover them. We did this before we looked at the real name. So we had the ‘invisible flipping worm’ instead of the midge larvae. We made ‘National Parks’ in miniature in the woods. Different groups made different things like rainforests, lakes, fishing parks or climbing trees – using only natural materials and on a small scale. We did lots. #geographycamp14 What is live blogging? We’ve been learning new skills this weekend. For me, Jabed, I have learnt how to write blogs. It’s been good as I’ve been documenting what goes on over the weekend, along with other people. We’ve used the Windows8 tablets, the iphones and the flip cameras to record what we are up to and share with the world. On the Windows8 laptop we’ve been doing live blogging. This is when you blog right at the very moment of doing something. I’ve used the centre wifi or Ms Debens phone to get internet and then it means I can write about what we do and share photos straight away. We’ve blogged from the woods during shelter building, from on top of the hill, from the campfire, wherever. Anywhere. It means parents and teachers and people from away can see our work and our fun. Also, we’ve been tweeting out pictures through the @priorysouthea and @priorygeography twitter accounts. Miss or Sir checks we are being safe and what we are uploading, and we make sure we don’t break e-safety rules but it’s good. It’s really exciting knowing other people can see what we do and it makes us proud when we get comments back or if people read the blog or favourite a tweet. So I’ve learnt something new. As part of the Geography Camp weekend we are working to achieve our level 1 John Muir trust award. This is where we do different activities to follow in the footsteps of John Muir who was an explorer who discovered different wilderness places and tried to tell people about them and how to look after them. We have done different experiences to Discover, Explore, and Share a place so the last thing to do is to Conserve. Conservation is where you look after something or protect it. Like with the rainforest when you need to conserve so that it is not all destroyed. The opposite is when you exploit something (like when the rainforest is all cut own to plant palm oil trees or something). Or you can do sustainable development which looks after resources for the future in a balanced way. A few years ago Priory started a conservation project at Juniper Hall where students did coppicing and trimming of woodland to help it grow and flourish. Then they used the waste materials to recycle to build a ‘dead hedge’ fence. This is like a hedge but is made of dead bits of tree that are all cut off like twigs and small branches. It is good to recycle materials as it means the carbon isn’t burnt but stays stored away, which means there’s not so much greenhouse gases to make global warming. Also it’s good for the little mammals like voles and mice or minibeasts that can build homes under it or in it. So we went to work to make the dead hedge bigger and neaten it up and to build some more around the centre. When Priory started this about 3 years ago there was only one hedge, and now there are 4 big ones around the centre. We got to work with some different tools to do this, like loppers and saws. We had to be really careful and work carefully together as teams to supply materials and build the hedge. It looked really good by the end and I was proud to help.